Eagle Cemetery Tour participants Sandy VanCampen Harris, Kathy Heicher and Coot Overcash walk through Sunset View Cemetery.The Eagle County Historical Society's Eagle Cemetery Tour is planned Saturday, Oct. 8 beingin Groups will leave every 20 minutes and the tour lasts about 90 minutes. 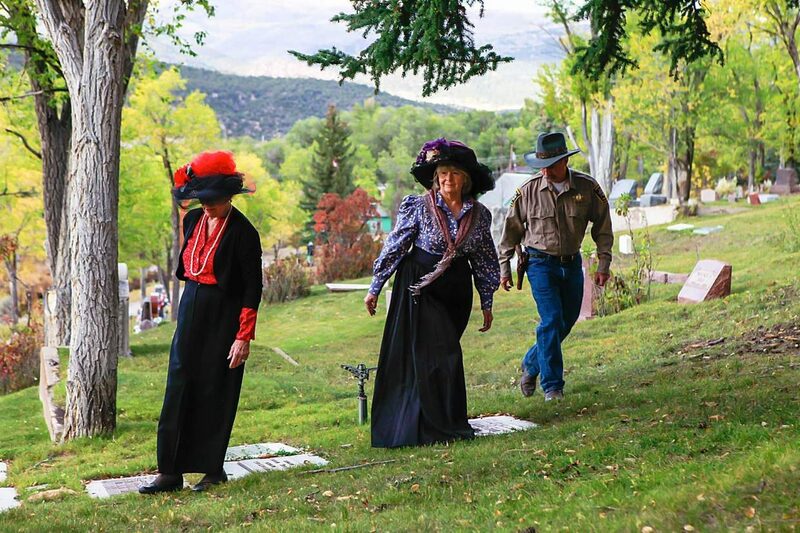 What: Eagle County Historical Society hosts the Eagle Cemetery Tour. When: Saturday, Oct. 8; first 90-minute tour departs at 2:30 p.m. and final tour departs at 8:30 p.m.
Where: Sunset View Cemetery in Eagle. Cost: Advance tickets are $15 per person for afternoon tours and $18 per person for evening tours. Tickets are also available on the day of the tour, but the prices are increased by $3 and some time slots are already sold out. Tour organizers recommend buying advance tickets. More information: Tickets can be purchased at www.eaglecountyhistoricalsociety.com. From the hillside that offers a panoramic view of the valley, the residents of Eagle’s Sunset View Cemetery have a great view of the community they helped build. Walking among those tombstones, it’s only natural to wonder about the tales those early pioneers would tell if only they could. This weekend, they will. The Eagle County Historical Society is hosting its latest cemetery tour Saturday at Sunset View Cemetery. The tour will feature 10 costumed local actors and one actual descendant of an Eagle pioneer, and they will all share the stories of heartache and happiness of the people who forged the community of today. Kathy Heicher, president of the Eagle County Historical Society, said the Eagle tour marks the fourth event of its kind hosted by the group. Previous popular tours were held in Red Cliff, Minturn and Gypsum. While many people see cemeteries as spooky places, Heicher see them as archives. A cemetery headstone is a tangible piece of history, and a local cemetery tour offers participants insight into stories they might not hear anywhere else. Heicher noted the residents of Sunset View Cemetery provided lots of great material for the Eagle tour. The tour touches on the lives of a Spanish influenza victim and Irish immigrants. The tour will tell tales of miners and ranchers and even the victim of an infamous murderer. John Clark, as portrayed by Coot Overcash, was an Eagle County undersheriff when he was murdered in 1961. Clark was on patrol along the Trough Road when he was shot and killed by Delmar Spooner. A manhunt followed the murder and ultimately led to the Spooner’s capture. Overcash said he didn’t want to give away all the specifics of his portrayal, but noted the story of Clark’s murder was huge news in it day. He said the community was terrorized by the fact that Spooner was at large. This is Overcash’s second cemetery tour gig. “I did Hank Elliot when they did the Minturn tour,” he said. He particularly enjoyed one of the tour groups, which featured three people standing in the back of the crowd, nodding their heads as he told his story. Local Mark Vodopich has been called into service to portray George Wilkinson, one of the first residents to bring cattle into the Eagle Valley. Vodopich’s enthusiasm for history let to his participation in the tour. “George Wilkinson had a long, prolific career and life in the Eagle Valley and became one of the most prominent citizens in the community,” Vodopich said. Vodopich said he is still working on his Wilkinson spiel, but he is set with his costuming. Vodopich is a member of the Colorado Historical Society, the Colorado Archaeological Society and the Single Action Shooters Society. As a shooter society participant, Vodopich dresses up in period clothing for events, so participation in the cemetery tour was a natural jump. “I already have the clothes,” he said. Evening tours will be offered for the first time during the Eagle cemetery tour. Battery-operated lanterns will light the tour path. “It’s fun to be in the cemetery at night, and it’s a lively way to present history,” Heicher said. Participants will begin the tour from the upper cemetery entrance, and docents will guide them along the route, which will include walking on uneven ground. Night tour participants should bring flashlights or headlamps. Tickets can be purchased in advance at the historical society website or on the day of the tour. The cost is $3 more on tour day. Tours begin at 2:30 p.m., and several of the times are already sold out. The last tour will depart at 8:30 p.m.
Heicher said over the past few years, the historical society’s cemetery tours have become its signature events. “For the first tour we did in Red Cliff, we weren’t sure the actors would show up or if anyone would come. We hoped to have 20 people come, and we had over 200 show up,” she said. To stage a tour, Heicher said it takes many people to complete the research and help out with the logistics. But in the end, both the people who organize the tour and the people who take it come away with renewed appreciation for valley pioneers. Copper Mountain 0” 1” 68"